your looking at a huge ancient egyptian ushabti. This marvelous piece is what is called an overseer ushabti. The overseer ushabti was in effect the manager of the some 365 ushabti placed in the tomb for work in the afterlife. This marvelous ushabti wears a lappet wig, has very large hands crossed at his chest. 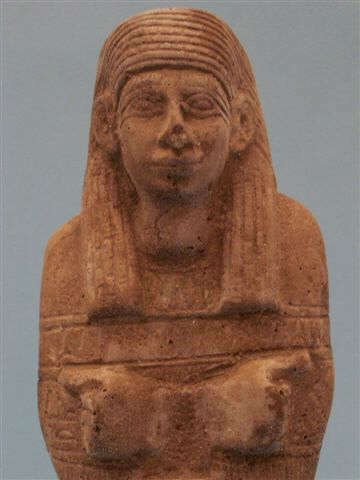 There is a small ushabti at the front of this ushabti which wears the solar disk crown of Goddess Hathor. There are hieroglyphics towards the bottom of this piece,made from Stone ,during Dynasty 12, The detail is symbolic to the artistry displayed by the ancient Egyptian craftsmen.pruched from An antique dealer. we don't guarantee this items exact age as we don't have Carbon Dating,nor chemicle analysis Abilities. This is solely Due to high cost and possible damage to the items and the known fact carbon dating is done only on materials once living And therefore we can not verify the exact age time frame of this PIECE down to the exact Dynasty, year etc. For this reason we start with a low cost and with no reserve! I obtain my items from various well known and legitimate sources (antique dealers some of those dealers have been working in this business since 1930's and 1940's) private collections and or estates), We have received all information regarding our items from second hand sources, and the timeline set on our items is to be used as a guideline for the above period listed.